Inadequate fixation skills must be addressed early in a treatment program before other oculomotor techniques are attempted because it is the foundation skill upon which others build. Start where your child struggles. Fixation is the most basic oculomotor skill, and not all children have problems in this area. While they may struggle with more complex tracking demands, they can hold a steady gaze on a stationary target. If your child doesn’t seem to struggle with these activities, skip the easier ones and start at the level where your child seems has to expend more effort to complete the task. Complete the Sticker Stare activity to evaluate the child’s skill level. If this is easy, skip the easier fixation tasks and move on to Lady Bug Noses. However, if the task is not automatic and the child exhibits any sign of forced effort (frustration, wiggling, short attention, stopping to talk, rigid body posture, etc. ), then complete all activities before moving on to other oculomotor exercises on the saccades and pursuit pages. In order to evaluate your child’s fixation, hold a small target, such as a tip of a pen or a sticker on a stick, about 16 inches in front of his/her eyes and ask the child to keep his/her eyes at the target without looking away. Observe if he is able to maintain a steady gaze without his eyes pulling off. If this is accomplished successfully for 20-30 seconds, increase the demand by asking simple questions. In addition to seeing if the child’s eyes are able to remain on target as he answers, also watch for other tell-tale signs of trouble. Children who exhibit a tense or rigid posture, anxiousness, excessive body motion or wiggling, or who require encouragement are usually having to expend additional effort to complete the task. Click on this link below to bring up the fixation exercise. Shark Attack! If your child has trouble maintaining fixation with both eyes, try having him/her cover one eye. Continue to work this activity with one eye at a time until performance improves; then work both eyes. Parents, please assure small children the little fish was not hurt but gets away each time to come back and play! For this activity you need a pipe cleaner and Fruit Loops or Cheerios. If you don’t have a pipe cleaner, you can also use a new shoestring with a knot tied in one end to keep the loops from slipping off. Working with one eye at a time, hold a loop between your fingers and with the other hand insert the pipe cleaner into the hole. Do not move the loop onto the pipe cleaner; the pipe cleaner needs to move toward the target since the purpose is to accurately fixate on the small hole. After you have a row of loops on the pipe cleaner, repeat with the other eye. Once you can complete the task efficiently, repeat the activity using both eyes. Bring It Home: Add a cognitive demand. Parents, say a word and asking the child to say an opposite word, e.g., high/low, white/black, tall/short, etc. (Use more difficult questions for older children.) Can he or she continue the task accurately without pausing or losing fixation? 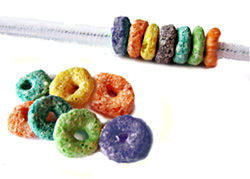 When the child is done, you can even turn the pipe cleaners and Fruit Loops into color bracelets! Instead of an eye exercise, the activity has become a fun arts-and-crafts project! For this activity you’ll need a straw, toothpicks, uncooked rice, and tweezers. Start out using one eye at a time. Hold a straw up and down with one hand. With the other hold a toothpick about six inches above and bring it down and insert it into the straw without touching the side. Can the child maintain fixation well enough to make accurate spatial judgments? Continue to practice. When this is easy, stop the toothpick above the straw and drop it in without touching the sides. Can the child maintain accurate enough fixations for the toothpick to drop through the straw? Next, pick up a grain of rice with the tweezers and drop it in the straw. With a smaller target, can the child maintain fixation? Continue to practice until the task is easy. Make an interesting target for your child. A popsicle stick with a small sticker on top is a great option. The sticker should not be much wider than the stick. If your child struggles with fixation, start with a larger sticker and then move to the smaller one. If your child still struggles, ask him/her to cover one eye. Does this improve his ability to perform the task? If so, continue to work this activity with one eye at a time until performance improves; then work both eyes. Encourage self-monitoring. Ask your child to tell you when his eyes move off target. Remember to increase the difficulty as the task become easier: Do math problems, stand on one foot, name all the children in his/her classroom, etc. Helpful Hint: Children often need an incentive to keep interested in the activity. Use the stop watch on your smart phone to time how long he/she was able to keep his eye steady before it moved off target. A little self-competition can help keep a child motivated. Keep the popsicle stick target for later use. It will come in handy for later tracking and convergence tasks. 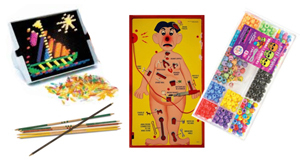 There are many good commercial games on the market that can help develop fixation skills: Operation, Lite Brite, sewing cards, stringing jewelry, and pick-up sticks to name a few. Not only do these help develop good fixational skills, but your child won’t even know he’s doing eye exercises! Attach the worksheet to the wall at eye level; stand 16-20 inches back. Hold a felt-tip marker next to your ear. The marker needs to be parallel to the ground with the tip pointing forward. Keeping the marker level, bring the pen straight forward and place a dot in the center of the first lady bug’s face, making a nose. Then bring the marker straight back to it’s original position beside your ear. As you become more accurate, increase the speed at which you move the marker until you can swiftly hit the target in the center. Parents: If your child has trouble doing this exercise with both eyes, try having him/her cover one eye. Continue to work this activity with one eye at a time until performance improves; then work both eyes.